If you like Sorcery! 1 and 2, you will probably like Sorcery! 3. If you don’t like Sorcery! 1 and 2, then you won’t miss out on Sorcery! 3. If you haven’t played Sorcery! 1 and 2, don’t play Sorcery! 3. I’m serious. Sorcery! 3 isn’t a game for newer players. The series uses an old choose your own adventure format, favouring text-heavy descriptions of events and occurrences. Most of the experiences you have will be via reading your character’s actions and game-based interactivity you play will be incredibly basic. As a game, Sorcery! 3 takes on a more investigative tone, in stark contrast to the previous Steve Jackson games. Here, your task is to defeat the Seven Serpents, monstrous henchmen of the main antagonist. To do so, you must trek through wild and vicious wilderness, experience strange things, and survive. Much of your time will revolve around finding clues on how to find and defeat the Seven Serpents, and a lot of that will be through dialogue. Oftentimes you’ll need to be quite diplomatic to find the information you need. 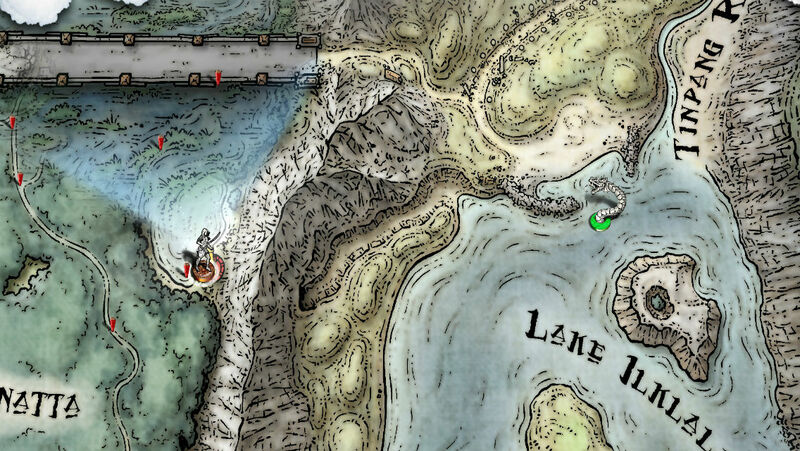 Along the way, you’ll find beacons, strange huts, and various oddities etched into the landscape. Every single thing seems to have its own little bits of stories and lore, so Sorcery! 3 feels more like a hodgepodge of mini-tales that come together to form a cohesive whole. But that’s where it ends. You see, Sorcery! is a game that uses text to describe events and emulate tension and activity. Gameplay is limited. Procedural clues come from the words on the screen, so there isn’t any strong kinaesthetic element. You don’t find a lot of gravitas in the controls that you’ll see in a lot of other games. There’s no swipe to control, no tilt-based feedback. As a game, it’s conservative in its design. There’s nothing wrong with that, but if Sorcery! 3 is going to be your first game, I recommend you pick up the first in the series instead. These games depend on each other to craft a coherent story. Otherwise, you’re thrust into an esoteric and hostile environment with lackluster game mechanics and unimpressive mini games. The game’s muscle is the storytelling, and Sorcery! 3 is not the place for beginners. It reincorporates several characters and elements from the previous two. Without the context of Shamutanti (first game) and Khare (second game), your experiences will feel strange. You’ll feel like an outsider, observing inwards on someone else’s experiences, not your own. 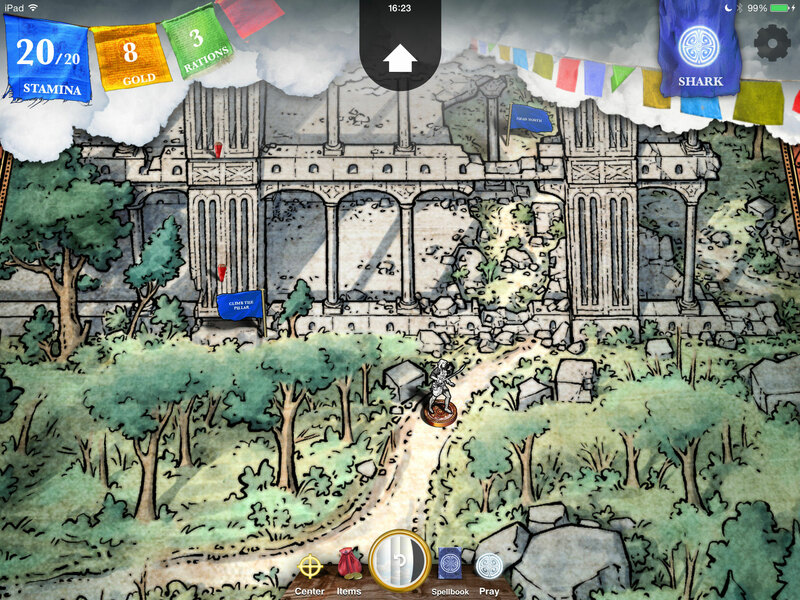 I understand why Inkle did that: at a fundamental level, Sorcery! works because it sells a rare, particular experience. It’s an electronic choose-your-own adventure book, crafting an “oldschool” pen and paper journey. In an era where computers can reinterpret any complex information into visual stimuli, it’s rare. By adopting this strategy, it allows Inkle to specialize. But because of this design decision, there’s little room for innovation. Change is risky. Sorcery! 3 isn’t about change. It’s about predictability. It’s about delivering a consistent experience. It’s a vivid descriptive tool for its world. It’s a firm foundation for its tea-stained aesthetics. It doesn’t suffer from bugs or visual imperfections: it’s sharp and crisp, clear and stunning, a phenomenal blend of visual congruity and prosaic might. It’s really, really good. And it’s only the case if you enjoyed the previous two. For good and bad, the same strengths and weaknesses in the previous two Sorcery! games are present in Sorcery! 3. In battle, the game’s liberal description of the enemy’s plans are still annoying. It’s too eager to tell you that the enemy is gearing up for an attack and then it decides to defend instead. Since maximizing damage is dependent upon attacking at the same time as your opponent, trusting the description will lose you more stamina than necessary. Sorcery! 3 doesn’t fix that. The mini games are still the same. It doesn’t matter that the locals call it Mind Stone or Swindle Stone or Whatever Stone – it’s the same damn guess-the-number-of-dices game from before. While it’s a nice and easy-to-pick-up game, it still feels like the AI is cheating, and it still gets old fast. It doesn’t fix that. The spell book is as useless as ever. Since spells are determined by three letter combinations, situations requiring spells can be deduced through brute force. Before casting your spells, the game tells you what spell it’ll be: this means you don’t have to memorize anything at all. Instead, you can just keep rewinding spells until something works, and while it can get a little tedious, it is the most effective way to get out of a lot of trouble. It allows you to game the system. It doesn’t fix that. The game’s artistic rhetoric is as confusing as ever. Beautiful, thick-inked Dorean pictures often show up during gameplay, providing a glimpse of the craggy, mossy, messy world. Yet there’s still no inherent significance behind these pictures. The pictures don’t symbolize anything, they don’t build up to anything. They’re just window dressing. While I enjoy window dressing, the pictures could have so much more significance. Having a picture doesn’t hint that an enemy is nearby. It doesn’t hint a boss is nearby. It doesn’t craft a clear, new scene. It’s a treat, but it’s still random. It does not fix that. Though I gripe, these aren’t unique to Sorcery! 3. These are part of the transition from a bookbased system to a mobile platform. These seem to be knowing and accepted design choices by the developers. Honestly, there’s very little unique to Sorcery! 3. In fact, the biggest thing to mention about Sorcery! 3 is the lack of change Inkle has made to the game. The setup is the same, the layout is the same, and nothing about it feels out of place. It’s still drag to move, the combat is as straightforward as ever, and the dialogue and art is still all through text. There’s a slight story change. It’s less exploratory and more investigative. Both the Shamutanti Hills and Khare thrust you into foreign environments. They generate a lot of curiosity. They stand in stark contrasts to each other. Shamutanti was wide, open, and showed the strangeness of a perverse, fictional Mother Nature; Khare showed the choking feeling of a bustling city and the evils that lay within. The Seven Serpents is, well, just ruin after ruin. It provides a clear goal for you, telling you that you need to find the Archmage’s Serpents so you can stop him, but it’s ponderous in its pacing. There’s a lot more backtracking in Sorcery! 3 than I remember having done in Sorcery! 1 and 2, primarily because I had to find so much more information on each of the Serpents. Additionally, the aesthetics of Sorcery! 3 don’t show me anything new: there’s always the new dark, quirky enemy, the strange cults, witches, demons, and happenings, but all that is in the previous games. You’re already familiar with this world and its dangers. Nothing surprises you. Well, not as much. For those looking for something fantastically different or radical, you won’t find it in Sorcery! 3. It’s the same. It’s conservative. It’s unchanging. It’s a continuation of the story. None of this is a bad thing, nor was it meant to be a bad thing. Based on the series’ context, and geared towards its intended audience, Sorcery! 3 is as well-made and well-oiled of a video game as it can be. It’s episodic. It doesn’t surprise you. It delivers exactly what you want and expect from the Sorcery! series. It’s wondrous and magical, but it’s the same magic you’ll see in the previous two. If that’s your cup of tea, then you’ll absolutely love it. Previous Entry Entertainium Co-ops Bloodborne!